Wedding Planning – Table Plan – Do’s & Don’t’s !!! If you looking at table plans, that means you have your venue booked and date picked. You have designed and sent out your wedding invitations and got all RSVP’s back. Now you have more decisions to make. Organising seating plan can cause weeks of hassle and stress trying to fit everyone into an arrangement that definitely won’t have the evening end in tears. With some careful planning, and help from your other half, you can find a fit that works perfectly for all your guests and we have some dos and don’ts to help you along. These simple table plan ideas are the perfect way to get your top table and your wedding seating chart under control. Follow these do’s and don’ts and it will be sorted in no time! DO find out how many tables you’ll have and how many guests they sit before starting to work out your table plan. DON’T split up couples if you can help it – most guests will prefer to sit with their partner. DO have a children’s table if you’re having younger guests. Positioning it near the door can be a good idea so they can be taken out if they misbehave during dinner. DON’T even consider putting any awkward single friends on the children’s table though – it’s a safe bet they’ll never forgive you! DO mix and match guests. You don’t have to place people in friendship groups if you think it might be cliquey. DON’T forget to think about the top table seating plan. Traditionally this table should seat the bride, groom, the bride and grooms’ parents, the best man and the chief bridesmaid, but you don’t have to stick to this! If you DO want to be traditional, the top table seating order runs from left to right as: chief bridesmaid; groom’s father; bride’s mother; groom; bride; bride’s father; groom’s mother; best man. If you DON’T want to stick to that, consider asking each set of parents to host a table of their friends and family or try some of these alternatives to the traditional top table. Need some more help? 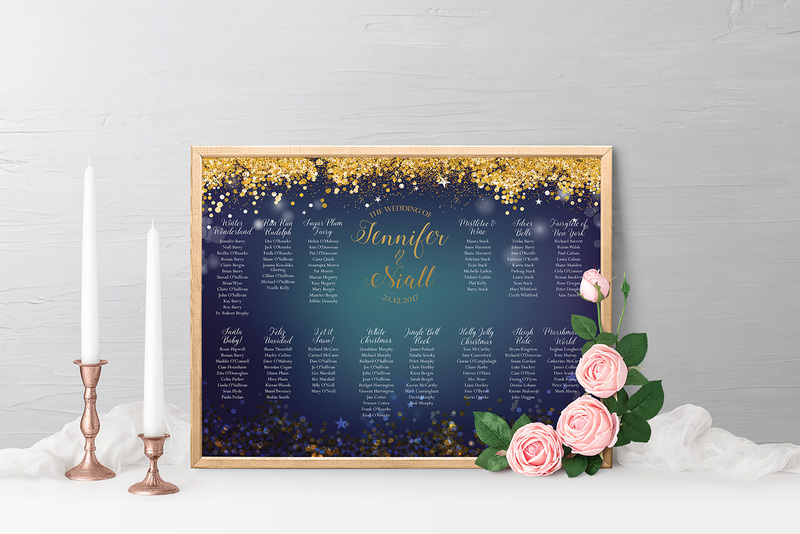 Give us a call here at The Invite Hub and let us design & create a truly unique Seating Plan, dinner menu, place name cards and table number cards for your special day. ← What You Should (and Shouldn’t) Put On Your Wedding Invitations?